I always prefer heels to flats any day of the week but city living requires a sensible shoe that can easily get me from point A to B without falling on my face. While I absolutely loathe pairing the word sensible with the word shoe, I must surrender my feetsies to some more comfortable and practical shoes. My latest obsession is the cap toe flat. I recently purchased this pair & this pair and have become utterly obsessed with them. Their metallic toe tip instantly makes the shoe a little more glamorous, adds a little added style to my ensemble and instantly gives me a pep in my step. This is how I would style my favorite flats for a day of shopping with friends! Absolutely obsessed with those leopard flats! I always wear flats, so I'm pretty positive I need all of these in my closet right now. I never wear flats but they are just so darn cute! I think I will have to add a few of them to my wardrobe! LOVE those pink and leopard flats! Perfection!!! 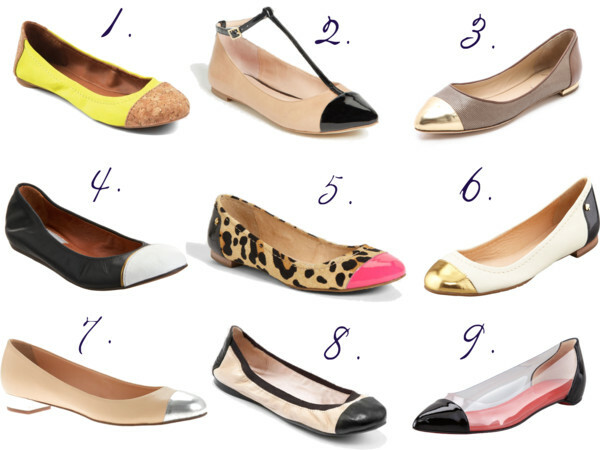 i love cap toe flats! i have 3 pairs and never want to take them off! Love #3 and #5 ! so cute !